It was gorgeous day when I woke up early this morning to do my ritual 2 mile jogging amidst the hills in my neighborhood. Soon after the nice run, I thought I would just simply enjoy the day, take a drive to Hollywood and check out what's happening at the Wildcard Gym. Besides, I needed to meet with Bobby Pacquiao so that I can hand him his brand new custom crafted mouth guard done in deep bright orange color. Bobby need a second mouth guard and as per request of Michael Koncz, his US manager, I made him another one. Apparently, in the State of New York, as in Nevada and many other States, boxers are required to have a second mouth guard available on his corner during the fight. I got to the Wildcard just about noon. I met with Bobby and in the presence of Mike Koncz, handed him his new mouth guard. Needless to say, he was extremely happy to receive another one from me. "Thank you, Doc Ed," he said. "This will really come in handy although I must confess the first one you made for me for the Famoso Hernandez fight is still as good as when you gave it to me. I will keep this one as a spare." 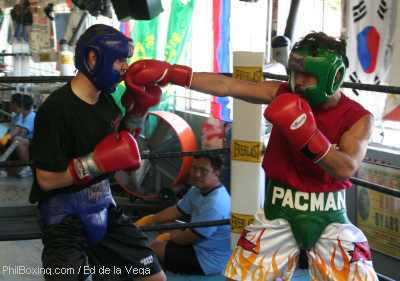 I stayed to watch Bobby do his gym work and a few rounds sparring under the eagle eyes of Freddie Roach and Buboy Fernandez. Speaking to Mike Koncz, I found out that Bobby is really doing very well and is on track per the schedule set by Roach. "He will be in top shape come fight night in New York on the 10th, Koncz said. But it will be a tough one considering that Kelly is a cunning veteran, however, I expect him to win." After Bobby's sparring, Buboy introduced me to two other Filipino fighters who will be on the Pacquiao-Larios undercard on July 2nd at the Araneta Coliseum. One was Arnel Fontanilla and the other is Gerry Peñalosa. I previously met Arnel in Manila during the 1st GAB Convention in April. In fact, I made him a mouth guard at our office in Cubao for a fight he recently had in Manila. Buboy told me that Arnel got tagged really good during that fight but with his new mouth guard he took it all in and eventually knocked his opponent out in the 5th round of a scheduled 10 rounder. I don't know about his mouth guard protecting him from a KO, but I was sure it protected him from serious oro-facial injuries. Buboy also introduced Gerry Peñalosa to me and indicated that he needs a new mouth guard for July 2nd. I told him to call the office, set an appointment and I will make one for him, or even two mouth guards. If that is what will make him perform better, I will be more than glad to help. I stayed to watch Arnel and Gerry spar and about half past 12 noon in comes Manny Pacquiao in his fancy white satin shorts with a "No Fear Logo". He immediately set out to bandage his hands to get ready for his sparing session. In between, he managed to have some picture taken with a few of his fans who were around. As soon as Manny was ready to go, an announcement was made for people who are not part of the Pacquiao Team to leave the gym. 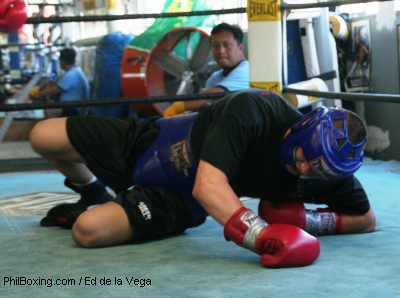 Man, Freddie Roach was serious in keeping people out of the gym to allow Manny to concentrate in his work. It was really a "closed gym session" for Manny. I am so glad that Roach and the Pacquiao Team gave me an exemption. I was allowed to stay and take pictures to boot! It felt good about being the only guy allowed to take pictures and I thank Roach and the Pacquiao Team for the privilege. Manny had two Russian guys who appear bigger than him as sparmates. The session was fast and furious and Manny was really throwing huge booms at the Russians. The first fellow did not do so bad although it was obvious that he felt every punch that Manny threw. The second sparmate however, did not do so well. In fact on the second round, he caught a left hook on the chin and even with his head gear to absorb the shock, he went down with a thud! With that, so much for the detractors that says Manny will not be in shape for July 2nd. I wished they were there to see that left hook! In the end, I felt good about my decision to go check out the Wildcard Gym. I had so much fun seeing our boxers and having a word or two with them. Ditto to the Pacquiao Team and Freddie Roach and his staff who are always so accommodating to me. And, I thought it will be just another day at the Wildcard Gym!